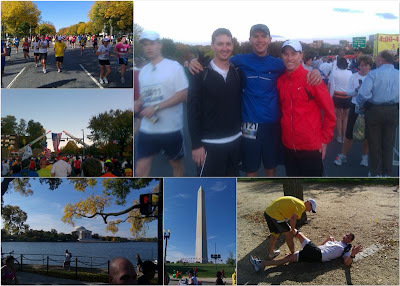 I had the privilege of traveling to Washington DC last weekend to visit my friend Brian and his family AND run in the Marine Corp Marathon with him and his bro-in-law...who also has the name Brian (Brian H going forward). Brian & I went to high school together. He's a great friend...plain & simple. 20 years is a long time to keep in touch and I'm grateful we have. Well, the race was spectacular. The MCM is the major marathon in DC. It's huge and the course is one of a kind. Brian & I concocted this plan to run it together almost 15 months ago. Over that span of time, Brian trained hard and we emailed often to check in on our preparations and to just get excited. The crisp fall day finally came and it was a good one. The Brians' and I got to the start in plenty of time to get in line and enjoy the pre-race festivities. When the cannon boomed, we were off with 21,000 other runners. As I mentioned the course was unique. It started at Arlington Nat'l Cemetary...crossed the Potomac River...cruised through Georgetown...circled around The Mall while passing the Washington Monument, Jefferson Memorial, Lincoln Memorial, White House, and Capitol...then finished with a pass through Crystal City and the Pentagon...before reaching the finish line at the Iwo Jima Memorial. Seeing DC by foot made me very proud of our country. Not to mention that most of the volunteers were Marines. Well, as with most marathons, unexpected things happen. Mine came at the .8 mile mark. Yes, that would be not even one mile into the race. We were just getting going when I kicked a raised piece of pavement. Next thing I knew, I was sprawled out of the road below me. My palms dug in but I needed my right knee to drag along the street to keep me from a complete face plant. Scraped up, shocked and utterly embarrassed...I popped up as quick as I could before I got trampled on...or caused a 200 person pile up! Brian had an early battle with his hips, feet & left knee around the 11 mile mark. His pain was intense and it wasn't the type you could just work out. We tried helping him stretch, but unfortunately he dealt with it for the remaining 15 miles. What a huge inspiration to me and Brian H. to run by his side as he persevered against great adversity to finish ALL 26.2 miles...his first marathon! Yahoo! Or...Oorah!...in Marine slang! The three of us were sore but celebrated our run with some greasy burgers & fries from "Five Guys". It was great to kick back and rehash the day and all the little details we could remember. Even though the race felt at times like it would never end, it did. Marathons do actually go by very fast no matter your finishing time. The true reward comes when that fleeting moment of the race leaves you with a memory of a lifetime. The MCM was no different. Thanks Brian & Brian H for a great day. Let's not wait 20 years before we do it again!